Ten laws of simplicity for business, technology, and design that teach us how to need less but get more. Maeda--a professor in MIT's Media Lab and a world-renowned graphic designer--explores the question of how we can redefine the notion of "improved" so that it doesn't always mean something more, something added on. Maeda's first law of simplicity is "Reduce." It's not necessarily beneficial to add technology features just because we can. And the features that we do have must be organized (Law 2) in a sensible hierarchy so users aren't distracted by features and functions they don't need. But simplicity is not less just for the sake of less. Skip ahead to Law 9: "Failure: Accept the fact that some things can never be made simple." 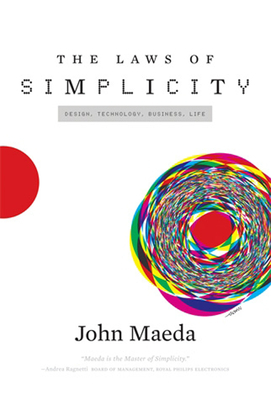 Maeda's concise guide to simplicity in the digital age shows us how this idea can be a cornerstone of organizations and their products--how it can drive both business and technology. We can learn to simplify without sacrificing comfort and meaning, and we can achieve the balance described in Law 10. This law, which Maeda calls "The One," tells us: "Simplicity is about subtracting the obvious, and adding the meaningful." John Maeda joined Kleiner Perkins Caufield & Byers in 2013 as Design Partner, where he works within KPCB's ProductWorks program helping entrepreneurs and portfolio companies to build design into their company cultures. From 2008 to 2013 he was President of Rhode Island School of Design and before that was Associate Director of the MIT Media Lab. In 2008 Esquire magazine named Maeda one of the 75 most influential people of the twenty-first century. He is the author of The Laws of Simplicity (MIT Press, 2006) and other books.